Bryum may well be the largest genus of mosses in the world with over a thousand described species, but it has been split into segregate genera by Spence (2005). It is exceptionally well represented in temperate and polar regions, and is especially common and diverse in California. The cells are mostly less than 4:1, and this differentiates local species of Bryum from Pohlia and its kin. The Bryaceae have recently undergone significant realignment, partly based on DNA studies. Many genera, historically placed in the Bryaceae, such as Pohlia, Epipterygium and Roellia, are now placed in the Mniaceae. Leptobryum has been transferred to the Meesiaceae. Mosses included in this section are costate and acrocarpous mosses mostly with papillose rhizoids and with rather large (more than 12 µm broad) hexagonal to rectangular, rather thin-walled cells. The pendant to horizontal capsules are mostly long cylindric and the peristome is complete or nearly so. The cells are short, seldom more than 4:1, and the costa has only an abaxial stereid band or none at all. Bryum algovicum Sendtner in C. Müller Hal. Bryum amblyodon C. Müller Hal. 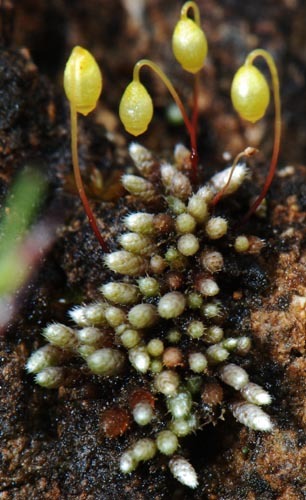 Outside of the family Bryaceae, gametophytes of Bryum may most easily be confused with members of the Splachnaceae (a family not yet documented for California) and Funariaceae. Members of the former family are usually collected with sporophytes, and the long or broad hypophysis characteristic of that family should allow easy differentiation. Similarly, the Funariaceae usually are collected with sporophytes, and can be recognized by the presence of a dome-shaped operculum that has essentially no apiculus. The basic pattern of areolation of the leaves of the Bryaceae typically can be distinguished from that of the Funariaceae and the Splachnaceae. The cells of the Bryaceae vary around a rhomboidal pattern; the cells of the Splachnaceae and Funariaceae vary around a quadrate to rectangular pattern. This results in a pattern of straight rows of cells in the latter two families. The leaves of the Splachnaceae and Funariaceae are mostly broadest above the middle; those of the Bryaceae are usually broader below the middle. The Bryaceae have axillary hairs of almost equal diameter from base to apex; the Funariaceae and the Splachnaceae usually have the apical cells of greater diameter than the basal cells. Finally, there is a tendency in the Bryaceae for the leaf buttress cells to extend as a shelf-like structure after leaf excision; the Splachnaceae and Funariaceae have no such shelf-like structure after leaf excision. Features of Bryum that allow identification to species include patterns of asexual reproduction. Some species of Bryum have multicellular, mostly spherical gemmae (tubers) of specific colors shallowly buried under the substratum near the stem base. Other species of Bryum have multicellular, usually elliptical or filamentous, stalked structures in upper leaf axils. The coloration of the leaf base may be reddened or it may be concolorous with the rest of the leaf. Such coloration features are features of the actual leaf lamina but coloration simply of the costa base is mostly irrelevant to species distinction. All Bryum have somewhat narrowed cells at the immediate border. The strength of the leaf border is important in species distinction. All Bryum have somewhat narrowed cells at immediate border but some species have markedly more elongate and narrow cells in several parallel series, and these cells of the limbidium may even make a multistratose border. Spence (1988) presented a very usable key to western North American species of Bryum, and much of the key that follows is heavily indebted to Spence. Since the writing of our key, Spence has produced a highly innovative treatment in FLORA OF NORTH AMERICA; we suggest it be used directly.